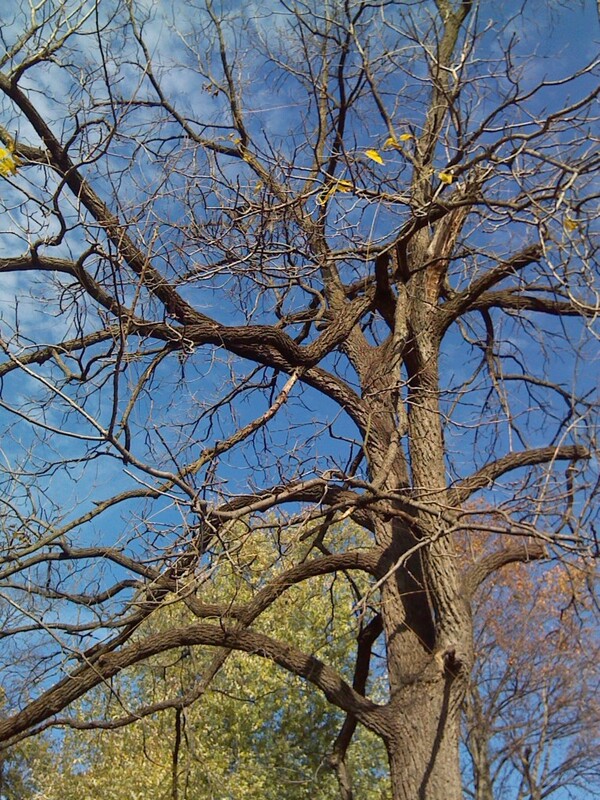 My neighbor’s big ol’ black walnut tree looks like winter is upon us, but it’s not yet. There are still a few walnuts lying around on the ground even tho the squirrels have been carrying nuts around for a month now. They may have heard another Polar Vortex could happen, and they are packing away supplies for the winter, whatever it will be. Me too, lol. We had a frost advisory a week ago and a warning for last night, but it was 40 when I woke up at 6:30. So we got a reprieve again. To the north in Maine and the south in states like Tennessee and Arkansas, they had significant snow fall just the other day. How crazy is that, they get surprised by a decent snow before we even have frost here. Just 3 years ago on 10/29, we had a freak 6″ snow fall while the trees were still full of leaves. Trees aren’t supposed to have leaves and heavy snow at the same time, and that morning when I went out back I heard wood cracking all over from branches breaking, some good-sized ones too. I was especially glad that this big wildflower didn’t freeze yet, tho it won’t be long now. More of them next year for sure. 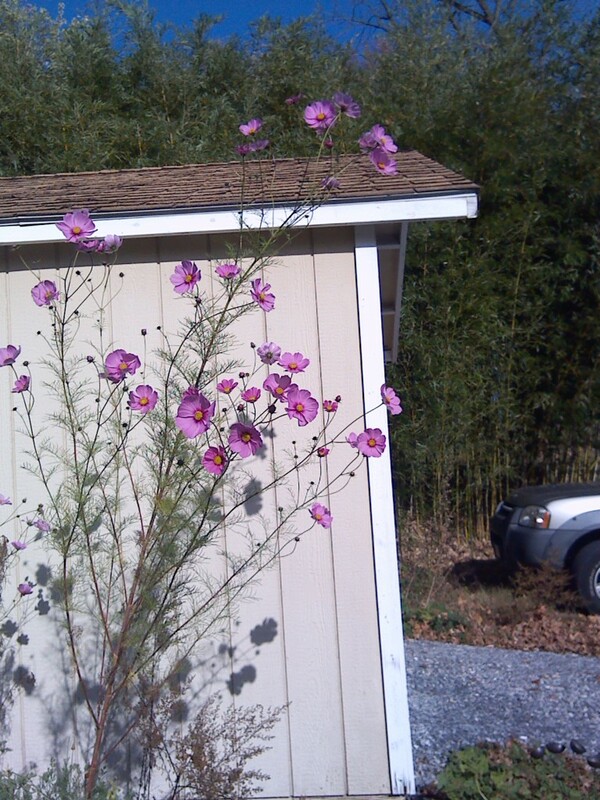 It’s taller than me and managed to get this beautiful growing in a pot, not directly in the ground. I’ve picked what I thought was the last of the Lima beans now several times. No new pods are coming on of course, cos blooming has been done for a month now. 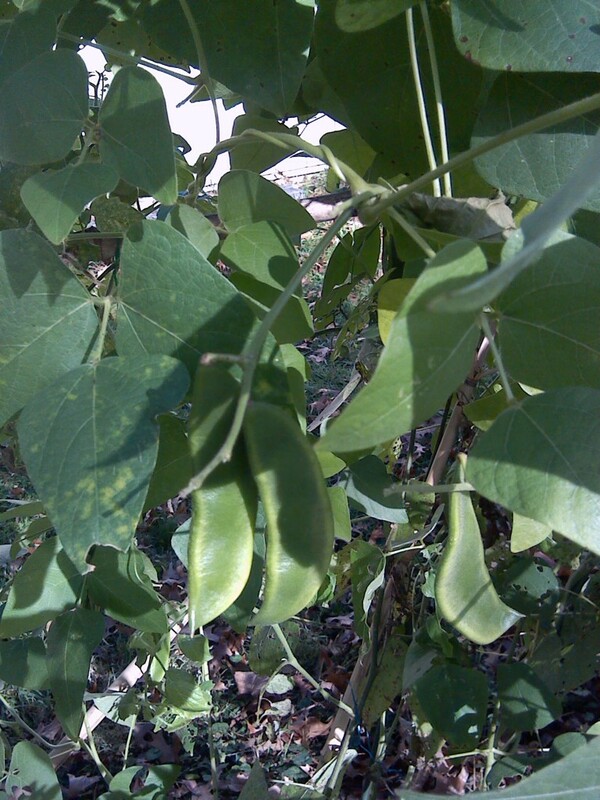 But the pods that are on the plants are still forming beans. And they are so good. Picking Lima beans in November, who knew. Dylan, my son, asked me last night whether I can grow black turtle beans here…….well there’s an idea, and of course, I’ll try it next year! Black beans for him, Thai purple podded yard long beans for his girlfriend. https://sarasinart.net/2014/09/26/thai-purple-podded-yard-long-beans/ Other beans for all of us and everything else I can think of as a bounty from the good earth next spring. If you give the earth respect, it will give you very much in return. One of the only good things about a frost is it will kill the epidemic of ticks we’ve had here this year, and that’s good for the hunters. Dylan is currently battling Lyme disease from some nasty little deer ticks that he got on him several weeks ago while he was out in the mountain. He was very lucky to develop the rings that show Lyme, and could start treatment right away. Many people don’t get those rings, and then they don’t treat the disease since they don’t even know they have it. We’re hoping that 3 weeks’ worth of a good antibiotic will get it out of his system and he’ll feel better, relieved of the muscle aches and headaches he’s having from it. I’m sorry to hear about Dylan. I read a news article last spring that said the the tick season was supposed to bad this year and it was. I wish him a speedy recovery. He’s lucky he caught it early. My best to everyone. It was very cold over the weekend with all the wind we had. It’s less windy today but still chilly. Fall is definitely in the air. My daughter’s brother-in-law and his family live in Maine and they got 3 feet of snow! Crazy! That is crazy, Jackie, 3′ already, even for Maine. Thanks for your good wishes for Dylan. He was SO lucky to get those Lyme rings, and actually started his antibiotic the next morning. It’s nasty stuff. We had a cold weekend but I was able to go out today and trim back some perennials, cos it was a little warmer. Have a good fall! Take us more good pictures when you’re able. Will do! Not much left on the trees after all that wind but there sure is a lot left on the ground! The landscape looks like it is in transition. Wishing Dylan all the best and a quick recovery! Thanks so much, Herman. It’s bad stuff that moves around in your system and makes you miserable. And best case scenario is early treatment. For those who don’t know they have it and it goes untreated, it can be debilitating for the rest of their lives. I’ve been hearing a lot about the tick problems up there Nancy, and you’ve confirmed it for me again. They say, whoever ‘they’ is, that the populations have swelled precisely b/c of warmer temps. The fact that you’re picking limas in November says a lot. Anyway, our snow is gone, and we’re back to warmer sunny days. The snow was gone by Sunday. I was able to work outside in a tee shirt yesterday afternoon! Freaky Friday indeed! Hope Dylan recovers completely from the Lyme’s disease. He’s got a good mama next door so that should help too 😉 Off to vote soon. They called it a tick epidemic this year Sam. And Dylan’s doctor and others are well aware of how to treat this since there have been so many cases. Years ago it was a bit of a mystery cos there wasn’t so much for them to gain experience. He feels rough some days and better other days. Yep, warmer temps, ticks and Limas in November in Pa. Glad your snow left quick and you could get back to normal there! I’ll be off to vote later myself.